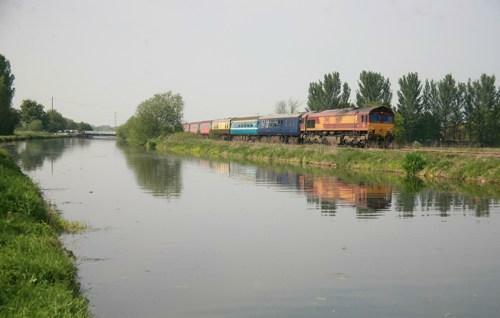 (3) It had been intended to travel to the end of the Sinfin branch and so the mileage quoted was to that point, (1m 16ch from Melbourne Jn). However, the timing sheet and working instruction were only to Sinfin Central, (0m 58ch from Melbourne Jn). Therefore the mileage at Sinfin central of 56m 16ch needs to be used for the Sinfin Central departure with all subsequent mileages reduced by 38 chains. (4) Booked to use the 'Up & Down Staveley Goods' but used 'Barrow Hill Goods' instead due to late running. (5) Booked from Hexthorpe Jn to Doncaster via 'Up Sheffield Goods' but went 'Main Line' due to late running. (6) to end of line. (7) Originally planned to go to Gascoigne Wood Up Sidings to reverse in order to cover the Selby West Curve on the way to Temple Hirst Jn. (8) Despite a path being found to enable the tour to traverse the Foreign Ore Branch, the required number of 'Ground Staff' needed to allow the train access, could not be provided on a Bank Holiday Weekend. (The same reason was given for the refusal of the Great Heck Siding early on in the negotiations).